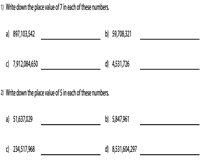 Employ this ensemble of multi-digit place value worksheets to provide students of Grade 4 to master place values for a range of large numbers in the millions and billions. Activities include inserting commas between numbers, MCQs, interesting word problems and much more! 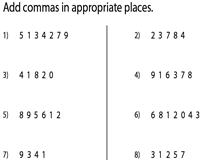 Observe each number and insert commas based on the place value. The first level of worksheets contain numbers up to hundred millions. Numbers in Level 2 comprise up to hundred billions. Read each number. 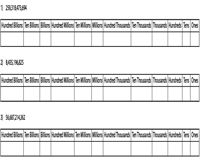 Identify and write down the place values up to billions in the boxes provided. A number of intriguing word problems are included for variety. Balance the equations with equivalent place values that vary up to billions place. Employ the answer key to verify your responses. 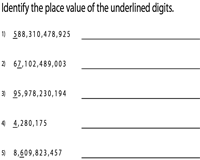 Find the value of the underlined digits in this series of multi-digit place value worksheets that features numbers in the millions and billions. Write your answers in either number form or word form. Solve the simple word problems provided. Identify the place value of a specific digit in a series of numbers ranging from 7 to 12 digits. Use the 'Download the set' option to access all worksheets from this section. 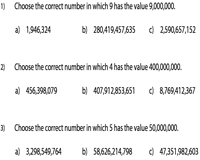 On the basis of the numbers and place values given, select the correct answer from a series of large numbers. This forms a perfect evaluation tool to gauge a student's comprehension of place values in millions and billions. Rearrange the digits of large numbers featured here to arrive at the largest and smallest millions or billions possible. Answer the elementary word problems that are included here. 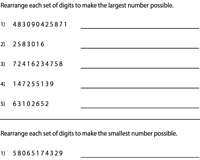 To find the mystery numbers, solve the clues provided in the form of place value of digits. 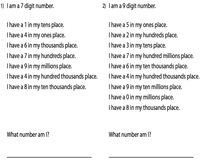 Print and distribute these multi-digit place value worksheets for an engaging classroom or homework assignment.